We all know that being blonde can include a bit of risky business! Those of you know who you are (I am included). Although, I would rather risk a few strands and LOVE my hair color than play it safe and be boring. Just my personal opinion! I have had many clients come in over the years with over-processed, damaged and broken hair leaving no choice but to cut and trim the already prevalent chemical layers they were given before me. Rather than risk the 80’s ‘do like Madge, I am so excited to share with you Pureology’s newest ammo for the blonde arsenal. 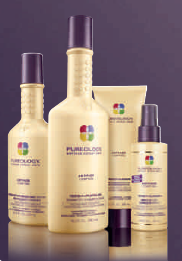 Pureology has launched another amazing product! Their Perfect for Platinum System is for highlighted and fragile, blonde hair that has at least 4 levels of lift. This new line is formulated with Keravis which is a natural “veggie protein” strengthening formula to help fill in the gaps on your hair strands while chamomile (softens your hair), lemon (clarifies for brightness) and coriander extracts (nourish to magnify shine). The system includes a Shampoo, Conditioner, Miracle Filler and Reconstruct/Repair. They are all loaded with the same yummy stuff as their other products which include zero sulfates, the anti-fade complex and Keravis (which helps provide internal and external strengthening). This Shampoo does have “sodium chloride” so I would not use it after a Keratin treatment. As a platinum blonde, I have noticed the biggest difference in my hair from the Miracle Filler. This is a daily leave-in that you blowdry in and it helps to leave strands filled and stronger after just one application. I have not been a fan of Pureology for my own hair in the past as I am sensitive to the “minty smell” and the products have not agreed with my own hair type. However, I LOVE recommending them to my clients for their anti-fade complex, being sodium chloride free (which can be used after Keratin Treatments) and overall hydration. So I am very pleased that this new line works with my nose and hair :) By the way, NO MINTY scents! These products are a little on the expensive side, but the trade-off is they are super concentrated and a little goes a long way making your dollar stretch. Wishing you a Perfect Blonde day!